LxWxD: 34.00" x 18.00" x 15.00"
LxWxD: 34.00" x 24.00" x 17.00"
LxWxD: 28.00" x 18.00" x 13.00"
Ameripack is recognized worldwide for having the most durable, most innovative Rotationally Molded Shipping and Storage Containers. Ameripack offers the largest assortment of sizes available from any source. 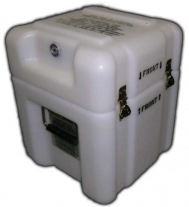 Our 13414 Re-Usable Military Containers are built to pre-defined military specifications. The specifications for these cases include the color, type of foam installed, stencils, and other options that make this case unique. If you are looking to make modifications to this case or container, please see the listing for our standard rotationally molded containers by choosing cases -> Search Standard Cases above and selecting Rotationally Molded Containers in our Case Construction Menu.